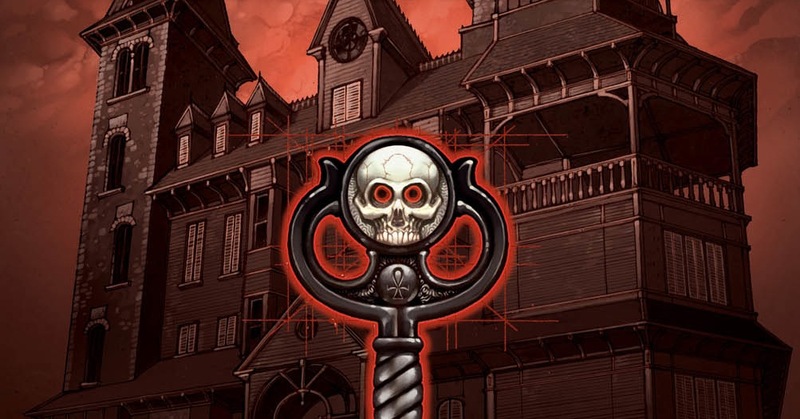 Welcome to Lovecraft, the first volume in Joe Hill’s Locke & Key graphic novel series, focuses on siblings Bode, Tyler, and Kinsey Locke relocating from California to the Keyhouse on the fictional island of Lovecraft, Massachusetts after Tyler’s classmate Sam Lesser murders their father. The murdered Mr. Locke was a high school counselor who met with Sam, and Sam fell prey to a demon named Dodge who projected itself through a painting on Mr. Locke’s office wall. The demon enthralls Sam and convinces him to try to find a particular magic key so it can free itself. After murdering his own abusive parents, Sam and his sociopathic friend confront Mr. Locke at the Locke family’s California summer house. Mr. Locke doesn’t remember the magic of Keyhouse and refuses to help Sam. Sam shoots him; Tyler overhears the shot and ends up subduing Sam with a brick. There’s a lot of really interesting stuff going on in this first collected volume of the series. One of the things that struck me is the characterization of 17-year-old Sam Lesser. He’s portrayed as a frustrated prodigy: the son of a violent, alcoholic father and a junkie mother, he’s emotionally stunted from all the physical and psychological abuse he’s suffered at the hands of parents and bullies alike, but nonetheless he is highly intelligent and artistic. He’s delinquent enough to have been sent to Mr. Locke’s office on a regular basis, but hasn’t done anything terrible … until the demon Dodge decides he’d be useful. Then, in keeping with the key theme, the demon unlocks the evil inside Sam. After Tyler bashes Sam’s face in with a brick, his visage (as one would expect) is rather changed. But instead of a radical deformation from crushed bones or puckered scars, Sam is drawn as having a face that looks stitched together, even months after the wounds would have healed and the stitches removed. He looks like Frankenstein’s monster: he’s a fiend who was deliberately and carefully created by Dodge. The demon raised him from the endless social death of an impoverished, bullied kid and gave him a new, terrible life. And, like Frankenstein’s creation, Sam decides that the best way to deal with the people who fear and despise him is to slaughter them. I’m not a fan of using physical ugliness as shorthand for evil (though Gabriel’s drawing Dodge as a beautiful girl or boy mitigates that somewhat). But in this graphic novel, visually linking Sam with both Hyde and Frankenstein’s monster works pretty well and adds an interesting layer to the narrative conveyed through the text.